Two of the world’s finest winter resorts, the Hotel Ciasa Salares and Hotel & Spa Rosa Alpina in the Dolomites in South Tyrol, Italy, have launched incredible winter deals from now until 31 March 2014. 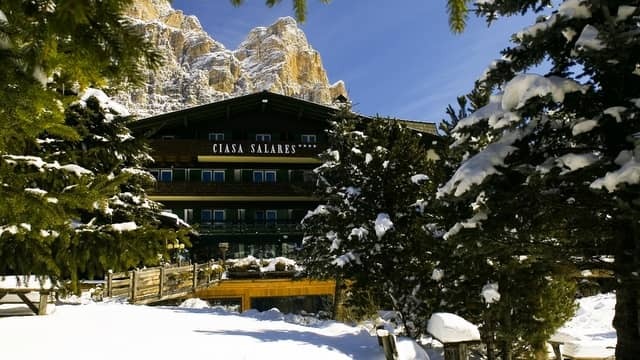 With accommodation rates ranging from EURO 165.00 per night, the family-run Hotel Ciasa Salares ensures travellers experience a true alpine lifestyle by combining mountain adventure with warm, home-like hospitality. Popular winter sports and activities in the area include skiing, carving, snowboarding, free-styling, ice-skating and curling. Hotel Ciasa Salares offers 50 rooms and suites, a BeautySPA Vives’ Finnish sauna and steam bath and the renowned Siriola Wine Bar that boasts $27,000 bottles, 1,850 wine labels and a “Best of Award of Excellence” by Wine Spectator. Hotel & Spa Rosa Alpina has also released two all-inclusive packages: ‘Stars of Alta Badia’ and ‘Skiing All Inclusive’. For those who consider themselves a bit of a gourmand, the three-night “Stars of Alta Badia” package, starting at EURO 990.00, is made especially for you. Upon arrival you are given a bottle of wine to sip on during dinner at the hotel’s Wine Bar and Grill, then on the remaining nights you are served a five-course gourmet tasting menu at the Michelin-starred restaurant, La Siriola and a five-course gourmet dinner at the Hotel & Spa Rosa Alpina’s two-Michelin-starred restaurant, St. Hubertus. The ‘Skiing All Inclusive’ package allows you to stay five nights in the De Luxe Double Room, Junior Suite or Suite, and will only charge you for four nights at rates starting at EURO 1350.00 per person. The deal includes daily gourmet buffet breakfasts, four dinners (including a five-course tasting menu at the hotel’s two-Michelin-star, St. Hubertus), four-day “Dolomiti Superski” ski passes, shuttle services to the slopes and a EURO 60.00 voucher per person at the hotel’s award winning Hotel & Spa Rosa Alpina Spa.